Watching Tobias Oliver is like seeing poetry in motion. “Shall I compare thee to Justin Thomas? Thou art more dexterous and slippery. Rough defenders do collapse the pocket around ye, but skilled in the scramble art thou.” Shakespeare this writer is not, but the point stands — Tobias Oliver can play. It is here. It is real. Sure, a degree of caution is naturally warranted with jumping to conclusions about the depth chart — Oliver had barely seen any substantial play time in the first half of the season, and as fun as it may be in terms of narratives to have a senior quarterback benched for an upstart freshman, that move backfires more frequently than it does not. But out of pure necessity, true talent has won out, and that talent is Oliver. This is not to slam the door on Marshall as he approaches the end of his Tech career. Marshall was given the biggest of shoes to fill and performed admirably despite Tech’s atrocious defense. That Tech went 5-6 in Ted Roof’s final year as defensive coordinator is not an indictment of Marshall – rather, it a testament to an elite triple option quarterback. Marshall has still performed well this season — his 4.9 yards per carry this season would be the best by a Tech QB since Thomas’ magnificent 2014 campaign were Oliver not on the team. Marshall is and has been an excellent triple option quarterback. But it is no longer possible to make the argument that Tech’s quarterback should be someone other than Oliver. Both Marshall and Oliver have seen roughly the same number of carries: 135 for Marshall, 132 for Oliver. But despite having fewer touches, Oliver has outgained Marshall by 121 yards. Oliver has scored three more touchdowns on the ground than Marshall. Oliver displayed the same kind of deep-bomb, coverage-breaking pass ability that Thomas did, albeit in limited action. What is more, Oliver has fumbled the ball on just 3.8 percent of his carries this season — almost half as frequently as Marshall, who sits at 6.6 percent. Of course, Oliver has gotten a fair share of garbage time minutes, padding his stats. But Oliver has seen impactful minutes against good opponents like USF and Virginia Tech and excelled. And whatever slippery-fingers issues that Marshall has struggled with have not manifested with Oliver — a factor independent of quality of opponent, given that most of Marshall’s fumbles have been dropped hand-offs or lost footballs, rather than fumbles forced by pressure. It has become apparent that Oliver is the Tech quarterback of the immediate future. Blue chip recruit James Graham’s red-shirt season looms on the horizon, but at the very least, Oliver has proven himself as the superior product to Marshall. Marshall’s senior season is about to expire, and were this a lost season for Tech, it would be by all rights fair to Marshall to allow him to finish out the season, knowing that Oliver has potentially three seasons of triple-option mastery ahead of him. But this is not a lost season. Tech started out the season just 1-3, yet they have found themselves with a non-zero chance of winning the ACC Coastal, in no small part thanks to Oliver’s superb play. 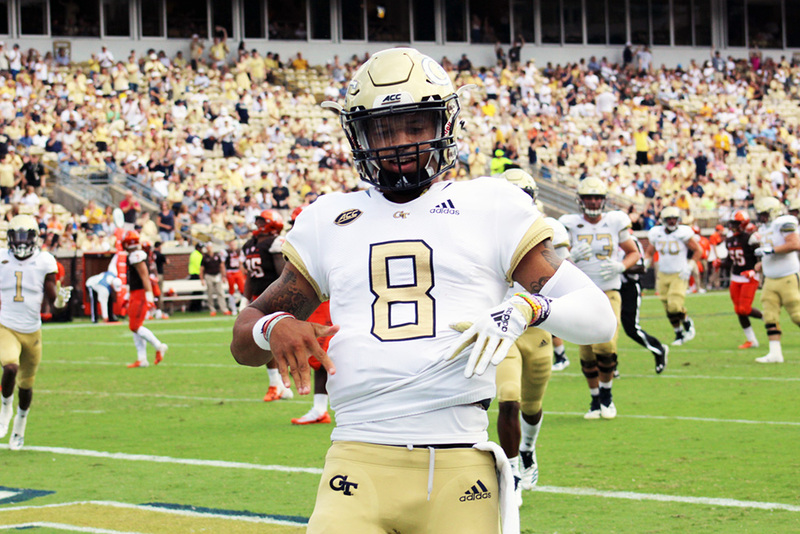 At the very least, Tech is just one game away from bowl-eligibility; a return to the postseason would be a welcome gift to Tech fans who suffered through the nightmare that was the 2017 season. Even if Tech loses any chance at the ACC Coastal, Tech is playing to reclaim their lost pride after their bowl-game streak was interrupted back in 2015. For the program and for fans, getting that kind of opportunity is important for Tech. Tech stands a good chance at winning these games with Marshall at the helm of the offense, and one can argue that Marshall has earned that chance, that right, as a result of his play and experience at Tech. But simultaneously, Oliver has that same right as this discussion might not be happening if not for him. This season has not been Marshall’s, but Oliver’s, and Oliver deserves more of an opportunity to finish this season than Marshall has. Seniority cannot take precedence in this instance — not when the future of a football program is at stake. Marshall has already established his legacy at Tech. No one will forget his wasted magnificence against Tennessee in the 2017 opener or his stellar campaign that season thwarted by Tech’s defense. And over the last two seasons, Marshall has been the model teammate in every visible way: he has always been forthright and polite with the media and has seemed engaged on the sideline in the last few games as Oliver has shone. There is no doubt that Marshall is a valuable influence on the young quarterback. And frankly, quarterbacks running Tech’s option are susceptible to injury; one way or another, the odds are good that Marshall will see meaningful snaps even if he is relegated to playing in relief. But it is time to begin building Oliver’s legacy. Tech has the postseason in its sights, and their best chances ultimately lie with Oliver. There is no guarantee that Oliver is starting at this time next year ­ ­— talented freshman James Graham, who red-shirted this year, or the returning Lucas Johnson may well be knocking at the door. But given that he might be the face of this program over the next few years, there is much to be gained in letting him take the helm for the last few games of the season against three quality opponents.